How to access and edit the email that is produced when someone fills out one of your forms. Go to the Form Builder. 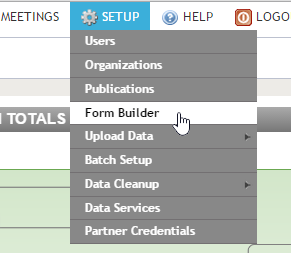 Go to SETUP ->Form Builder. Click the Edit icon next to the form you wish to change. Go to the Email tab. Make the edits you want to the form and click Submit to save. (1) Enter a name and email address that you want the email to come from. (2) Enter a CC confirmation email address if you want one. (3) Enter a BCC confirmation email address if you want. You can have multiple email addresses, just separate them by a semi-colon. (4) If your form doesn't require an email address to fill out you can still receive a confirmation email if you check the box. (5) Enter the email subject. (6) Compose your email. You can create links and put images in using the WYSIWYG (what you see is what you get) editor. (7) Click the Submit button to save and you're done!